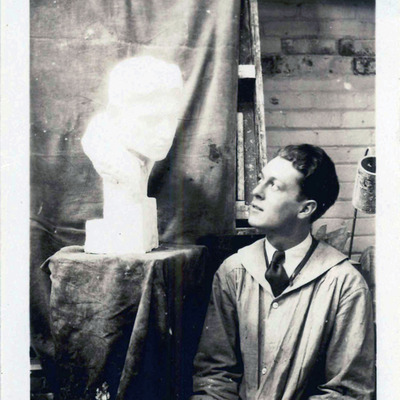 In 1930, following his graduation from the Cleveland School of Art, Marshall Fredericks was awarded the Herman Matzen traveling scholarship to study in Europe. On the Vermont marble wall behind the figure are the official seals of Wayne County, Michigan and the City of Detroit. Engraved on the wall is a verse from II Corinthians: “Now the Lord is that Spirit, and where the Spirit of the Lord is, there is Liberty.” Designed to continue the thought indicated in the inscription on the wall, the sculpture is in the form of a kneeling man with outstretched arms. In his right hand he holds a father, mother and child representing family, which according to Fredericks, is “probably the noblest human relationship.” In his left hand, the figure bears a sphere with rays emanating from it signifying deity. Fredericks chose the sphere because it’s an object complete in itself with no beginning and no end.